We spent the last two days in our first part of Nordic country, Finland. Our flight was pretty uneventful, and we got into Helsinki without any hiccups. Helsinki is very expensive. To go 11 miles from the airport to the hotel cost over $50! Beers at the hotel bar started at $10 and went up. Safe to say, we didn’t booze the night we got int. We would have if our house would’ve closed a tad earlier, but of course it took 2 hours, and by the time it was done, I was passed out and the bar was closed. 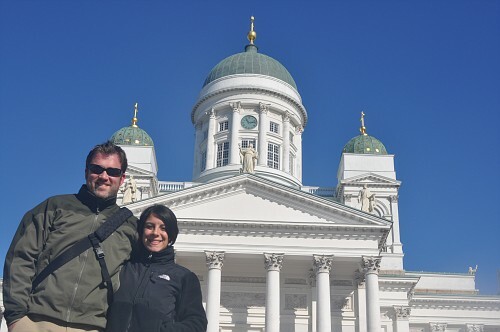 We hit the ground running yesterday as it was our only full day in Helsinki. Once again, we had great weather, albeit a bit cold, but nice none the less. 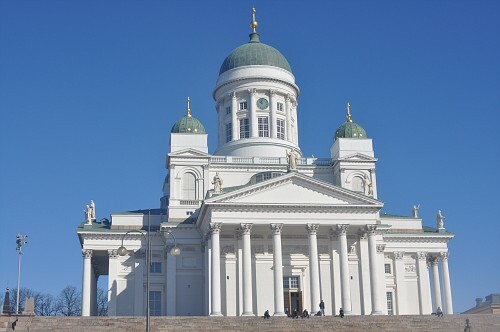 I wanted to hit the Lutheran Cathedral, which I’ve seen on every special I’ve ever watched about Finland. All I ever heard was that it is VERY white, and is one of the highest points in Helsinki. Well, it is VERY white, with green domes. It practically looks brand new, but of course it’s not. 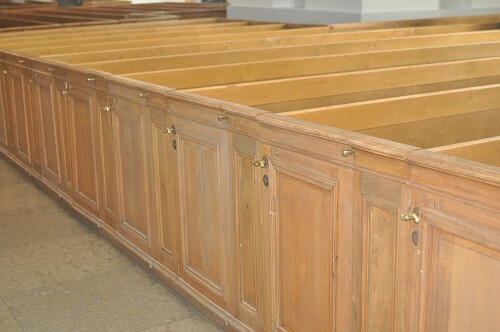 You were allowed to tour inside for a bit, which was really no different from any other old church you’ve been in, other than it had no color except white, and the pews had doors on either end and were numbered. Assigned seating at a church…wonder how much admission is? From there we walked along the waterfront a bit, which had some of the huge cruise ships that sail between Helsinki and Stockholm. It’s a 40 hour round trip cruise between the two cities…but only a 40 minute flight! I can imagine it’s pretty nice in the summer time, especially with all the fast boats that travel over to Tallinn, Estonia…which were unfortunately not running since it’s still too cold. Our cab driver on the way to the hotel said that is one of the top things to do while in Helsinki…leave to visit another country, ha! We grabbed some lunch at the Old Market Hall, and then headed to a tram which doubles as a tourist tram to see the city and its’ sights. Trams are all over the place in Helsinki as the main form of transportation, and they move quite fast. We stayed on it until we hit Olympic Park, which was built back in the early 50’s for the 1952 Winter Olympics. Impressive? Not at all, but then again it’s almost 60 years old. 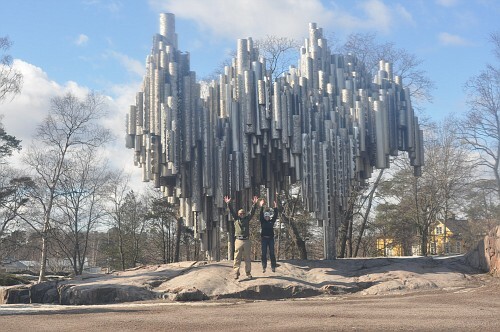 From there we walked over to the Sibelius Monument, which is the most famous piece of public art in the city. As you can see from the picture, it’s unique, but I don’t think many would say it’s too eclectic. We got some great pictures while we were there because….we were the only ones there! Gotta love the off season for tourism. We took off from there to go see yet another church. You’d think that I was very religious with all these church visits, but the few that we saw in Helsinki are pretty unique. 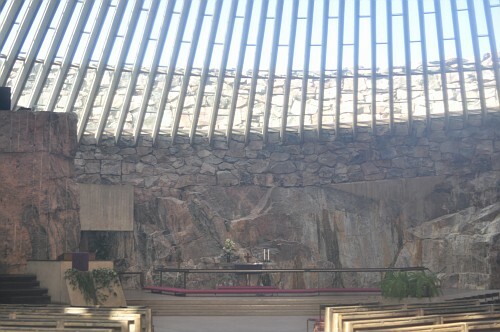 This church, called Temppeliaukio, or “Church in the Rock,” is exactly that. There was a huge rock in the middle of the city, and they decided to build a church inside it. Fortunately, we were allowed go inside and tour around…and again, we were the only ones there. This place is very impressive, as they had to blast out all of the rock to build this church within…and also blast deep enough to have an air raid bunker below it which has room for 6,000 people. I’ll put a video of the church up on YouTube, but you can see from some of these pictures, it’s pretty incredible. On top of that, the dome on top of the church is made of copper, and is in a spiral, which if straightened, would measure 13 miles long! 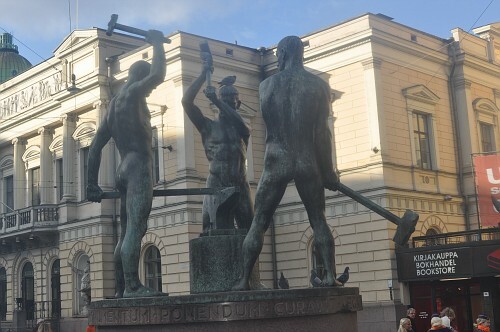 After we left the church, we wanted to see if we could find some souvenirs of our visit to Helsinki, so we headed over to the main department store in town called Stockmans. I wish I could have taken a picture inside this place. It’s 8 floors, and is a mix of Macy’s, Crate & Barrell, Home Depot, Barnes & Noble, 7-11, and a smoke shop. Oh, and it’s packed with people, all day!! You would never know that we are in a recession if you stepped in this place. I think every third person we saw walking around the city had a bag from Stockmans, it was nuts. The Finns definitely like to shop. You would only see this type of craziness during Black Friday. Safe to say, we didn’t last long in this place and got out as quick as we went in. We wanted to cap the day with having a traditional Finnish dinner. We received a recommendation from a business colleague of mine to look around for some Reindeer. We found one restaurant, and the hotel suggested that we hit that one as well, eventhough they had reindeer at their own hotel restaurant?! So we got there, after walking by the place by a mile and turning around, and ordered some reindeer and elk. Don’t take offense if you are vegan, but this stuff was GREAT! Tastes completely different from venison, and we got to try it roasted and in sausage form, and both were delicious. I would come back to Helsinki just for that alone, and I suggest you try it if you ever see it on a menu. Anyway, we are sitting at the airport waiting for our flight to Copenhagen, where we will see the Little Mermaid and hang out for a day before we hit the high speed train up to Stockholm to finish this journey. We’ll catch from the land of the Danish!